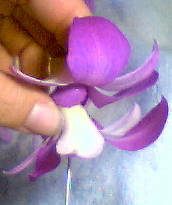 How to make the beautiful orchid leis seen on the website. Cut a length of thread (doubled) or dental floss (not doubled) 50 inches long. a clip of some sort (I use clothesline pins) at one end. Pluck the stem from each blossom, one at a time or pluck them all before you start. If you’re making a lot of leis, have one person string and one pluck. 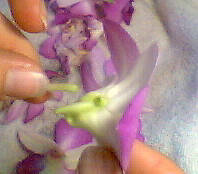 Sliding the needle on the ‘lip’ of the flower, pierce the flower about a 3/8-inch below the stub of the stem. 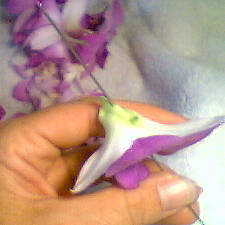 Continue adding flowers on the needle, gently nesting the end of each flower into the ‘mouth’ of the next. The line of pierced blossoms should look like a stack of nested hats. 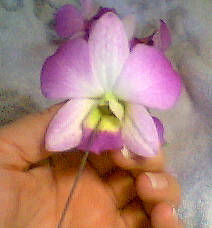 Grasp every 4-5 blossoms gently in the palm of your hand and move down to the end of the thread. 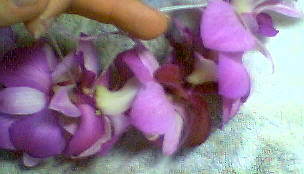 String 80 blossoms for a 40″ lei. Finish the lei by nesting the first and last flowers and tying a square knot. Leave a ‘tail’ to carry the lei with until you are ready to present it. Lightly mist each lei as you complete it and store in the vegetable bin (lined with newspaper) of your refrigerator in loose plastic bags. Turn down the refrigerator if you can. Orchids are a lot like lettuce, they don’t like to be too cold and they will turn clear if they directly touch the sides of a cold refrigerator. The leis will last up to five days in the refrigerator, misting as needed – however, they are still best used no later than the next day.